McALLEN — A court granted bond for a county bailiff accused of playing a role in a cocaine conspiracy. U.S. Magistrate Judge J. Scott Hacker granted Oscar De La Cruz a $200,000 bond after a detention hearing Tuesday afternoon. De La Cruz walked out of the McAllen federal building at about a quarter to 6 p.m., after his family paid $5,000 of a $200,000 bond, his attorney Santos Maldonado said Tuesday afternoon. More than a dozen friends and family were seated inside the federal courtroom, including De La Cruz’s wife Areli Garza De La Cruz, who appeared distraught and nervous prior to the hearing. 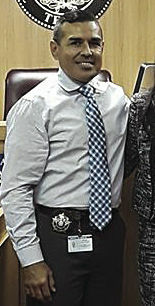 The government, represented by Roberto Lopez Jr., did not oppose the release, but instead asked the court for specific conditions be set for the county bailiff, like GPS monitoring, and that De La Cruz not return to work because of his access to sensitive law enforcement and court records. The court ultimately decided against GPS monitoring as a condition of De La Cruz’s release — yet it’s unclear whether or not his returning to work was a condition of the release, Maldonado said. When asked about De La Cruz’s employment status, Judge Albert Garcia of Hidalgo County Court-at-Law No. 6 responded — through his court staff — that De La Cruz “is not expected back at work,” and that he had no further comment on the matter. Such privileged information, which De La Cruz has access to because of his position with the courts, is what the government alleges he provided to unnamed confidential sources as part of the conspiracy. During the hearing, Lopez mentioned specific details not yet made public, but related to the investigation into De La Cruz. Lopez said that FBI officials believe De La Cruz may have provided sensitive court and law enforcement information to other people, including federal court documents. Specifically, De La Cruz provided a federal search warrant to unknown co-conspirators. In De La Cruz’s complaint, individuals referred to as “CS 1” and “CS 2” outlined how they worked with an official at the county courthouse to get their hands on “fictitious” court documents helping them steal the substance from suppliers. “CS 1 further stated that during this period, he and others used these false documents to steal more than 5 kilograms of cocaine,” the complaint states. An additional cooperating source, referred to as CS 2 in the complaint, stated he was using someone named “Oscar,” who was working at the Hidalgo County Courthouse, to help them get their hands on the documents. Eventually, one of these ‘fake” documents ended up in the hands of federal agents. Citing other concerns, Lopez said he believed De La Cruz was not completely forthcoming in disclosing his current finances as part of the detention hearing, which requires the defendant to completely fill out a financial affidavit prior to the detention hearing. Lopez said as a result of the investigation into De La Cruz, the government learned of unexplained cash deposits from De La Cruz through bank records. The court pushed back on the government’s request for a monitoring device, asking that if he really wants to flee what good would a monitoring device do. Lopez responded that it would at least give U.S. Marshals notice of his flight. The court said “large cash deposits” were “too vague” a reason for the GPS device, and asked Lopez to provide more information on his argument for the conditions, which the government agreed to provide under seal. After the information was provided, the court continued the hearing and approved the bond release with the conditions requested from the government. Prior to the start of the hearing, Hacker made De La Cruz aware of a potential future conflict of interest regarding his current counsel, Edinburg-based Maldonado. Hacker told De La Cruz prior to the hearing that he may opt to use another attorney, as there may be a potential conflict in Maldonado representing him in the future. He said a pending superseding indictment may be a conflict preventing Maldonado from representing De La Cruz — this is due to Maldonado potentially representing a defendant in the indictment in question. Despite the warning, De La Cruz opted to keep Maldonado as his attorney for the detention hearing.